I had Friday off and used it for general loafing: reading magazines, watching TV, napping … and making jam. Tomato jam, that is. See, along with last weekend’s heirloom tomatoes, we also received a gift of tomatoes from a friend’s hydroponic garden, and they were beginning to pile up. 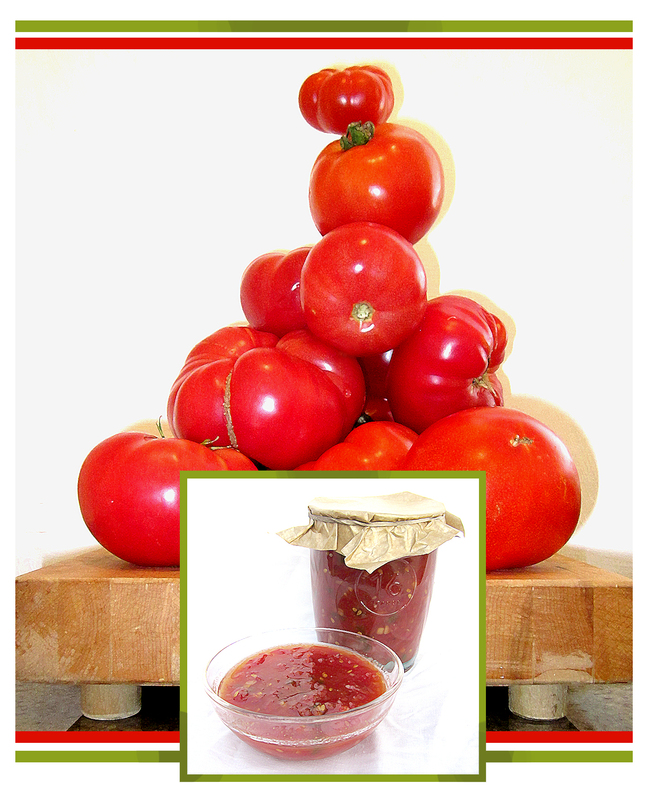 After reader, Miss Lena, suggested tomato jam while commenting on the previous post, I did some research and found an intriguing recipe from the New York Times’ minimalist chef, Mark Bittman. His recipe appealed to me because it included jalapeño peppers, as well as cinnamon, cumin, fresh ginger, lime juice and just a tiny bit of cloves; it also included a fair amount of sugar, which I had concerns about but I figured he knew best. So, late afternoon, I assembled all the ingredients, chopped 6 pounds of tomatoes and, following his instructions, got the whole lot simmering on the stove. Smelled delicious and looked even better as it cooked down … I couldn’t wait to taste it! After 90 minutes I poured the silky smooth, shiny red mixture into a bowl to chill. I couldn’t resist a taste: very tomato-y, with spicy, savory, sweet and piquant notes from the various ingredients and absolutely delicious! Read Bittman’s NYTimes blog post here; it includes not only the recipe but also a video. Full disclosure: I also added 4 chubby cloves of finely minced garlic to the pot and think the garlic added even more flavor … after all, if I could fearlessly alter a Martha Stewart recipe, why not one by The Minimalist? The jam looks awesome, and I will try this recipe right after I make this batch of fig and blackberry jam. No, you’re right: a garlic mince or rub and most anything is elevated … even fingers: I love the smell of garlic lingering on them! Fig and blackberry jam?! Sounds fan-freekin’-tastic … I do love figs dearly! Yes, fig and blackberry jam. I got the idea from when I made raspberry fig honey last year. Was delicious, so I’m trying blackberries this year. I’m going to try a raspberry and date jam when the raspberries come in next month. That sounds good–but what do you eat it with? Is it like a salsa or something? My very Italian neighbor freezes her garden tomatoes. When she’s ready to make pasta sauce, she thaws them and she says the skins come right offf–then she cooks them just the same as if they were canned or fresh. Works for her. Hey, HB, think of a salsa/jammy spread you can eat however you would those things, really delicious … and you’re exactly right: how could anything tomato not benefit from a little bit of garlic?